Breq is both more than she seems and less than she was. Years ago, she was the Justice of Toren – a colossal starship with an artificial intelligence linking thousands of corpse soldiers in the service of the Radch, the empire that conquered the galaxy. An act of treachery has ripped it all away, leaving her with only one fragile human body. And only one purpose – to revenge herself on Anaander Mianaai, many-bodied, near-immortal Lord of the Radch. 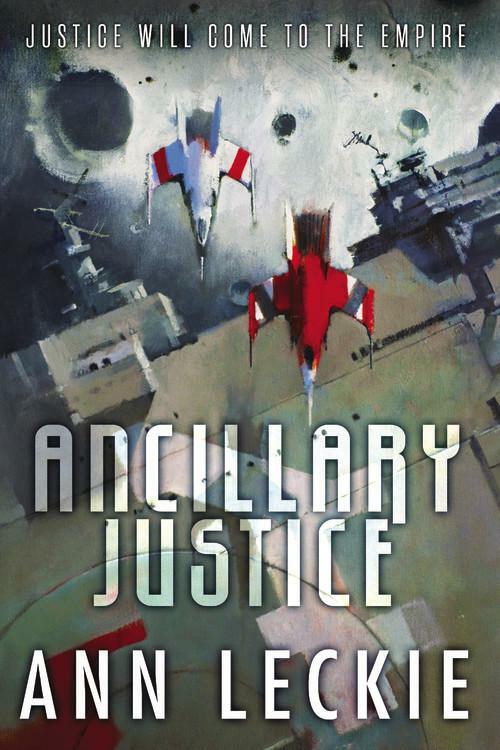 Rarely does a space opera live up to its full scope and potential, but Ancillary Justice does just that, with style. This book is big, smart, and ambitious as hell, with everything from AIs, the politics of conquest, and every-day realities of living in a surveillance state, to religious annexation, marvelously alien worlds and cultures, and questions of power, corruption, and identity. Now THIS is what I call space opera. First off, the world building of this book is phenomenal. From the start distinctions are clearly drawn between the Radch and the peoples they conquer – in fact, we learn that the very word for “civilized” is in fact “Radch” (because the Radch, you see, are the only civilized people in the universe), which says so much about the prejudices and propaganda at play, all of which lead theirs to be a civilization perfectly willing to commit genocide. And of course, once those same “uncivilized’ worlds are annexed, those who survive quickly become Radch citizens, with their religions and cultures incorporated into the empire – and so the malleable and at times painfully ironic definition of “civilized” makes for brilliant background to this story. But even more brilliant and eye-opening is how the Radch don’t use gender pronouns – and so Breq, our narrator, refers to everyone as “she”, which is just mind-blowing in how it explodes every gender norm and assumption you could possibly make. I never truly realized how much cultural baggage we have embedded in those simple labels until they were stripped away – and as the characters are snapping orders or sleeping with each other or committing murder, you can’t help but realize how often you’re culturally inclined to assign such behavior to a gender category – except in this story, you can’t. And it’s unbelievable how that one simple convention strips away all stereotyping, both in terms of the story itself and in how we readers read it. All in all, this is a fully realized world, with a lot of intelligence behind its design. But far and away, my favorite part of this story was our narrator, Breq – who is also The Justice of Toren (well, kind of). And therein lies another mind-bending aspect of this novel, which is the question of identity – because Breq, of course, is not human, and yet she controls hundreds of what are essentially empty human bodies, directing them like puppets and experiencing their emotional responses, so she does feel human, in a way, at times, even as she watches herself through the eyes of her ancillaries, across the town square, up and down the street and serving shipboard, all at the same time. And yet, what is Justice of Toren – for how much of such a vast AI can truly fit into each and every one of her ancillaries? So are they all fully “her”, or not? And at what point does individuality assert itself? All of which leads to the twenty thousand dollar question – what, then, is Breq truly, now that she is no longer all she was? It was all just mind-boggingly interesting, both as a narrative device and for the larger questions it raised about the meaning of identity – and yet all the while, Breq becomes more and more of a person to us, through her narration. Which brings us to the plot of this opera – which at heart is a good old-fashioned story of revenge, or justice, or both, or neither, all depending on what you believe the motive behind Breq’s quest truly is. And again, therein lies the brilliance of Breq, our enigmatically human, inhuman enigma – and as she slowly becomes the most human thing about this story, she still remains, on some level, baffling (which only makes her more human, in a way). All of which is brilliant, needless to say – but there is a flip side to that, and it’s really the only thing I can say against this novel, which is that it does take a stretch to build up empathy for Breq, who is essentially an alien narrating an alien world. And so at the start, to me her narration felt a bit distant, a bit chilly – but the more I understood what had happened to Breq, what she was and what she was all about, the more she became, for lack of a better word, human, to me, and so the more I cared about whether or not she would survive this crazy assassination scheme – all of which lead to a delicious build-up of tension, which paid off very nicely at the end. So in case all the superlatives up to this point haven’t been clear enough, let me say it again: this book is the real deal, original, intelligent, and entertaining. Lecke creates a wonderfully complex portrait of a universe both built upon and torn asunder by imperial designs, and yet at the same time, even with everything there is to this story, it still remains an easily comprehensible and digestible read – which in a story this dense is a feat in and of itself. All in all, this book is the kind of space opera that will renew your faith in the genre – so yes, please. This. More of THIS. It’s not every day a debut novel by an author you’d never heard of before derails your entire afternoon with its brilliance. But when my review copy of Ancillary Justice arrived, that’s exactly what it did. In fact, it arrowed upward to reach a pretty high position on my list of best space opera novels ever. First-time novelist Ann Leckie’s Ancillary Justice is a tale of war crimes whose astropolitical scope is stunning. It’s a military thriller, a mystery, and a very complicated love story about sentient starships and hive minds in an alien civilization that looks a lot like something out of Earth’s history.